When treating a pinched nerve it is important to take pressure off the nerve so the nerve can conduct properly. In Physical Therapy, we can use mechanical traction or hands-on techniques to reduce the nerve compression. With these techniques we look for a reduction of pain and intensity. Typically, the further the symptoms go down the arm or leg, the worse the nerve symptoms are. Therefore, any treatment that the patient feels their symptoms are lessening further down the leg or arm means that the nerve is being pinched less. The nerve itself should also be treated. When the nerve is pinched it can become inflamed and irritated. We use techniques called nerve mobilizations or ‘neurodynamics’ to improve the nerve’s mobility. Think of a nerve being like a bungy cord. Normally the nerve has enough elasticity to lengthen with the arm to reach and stretch. But when the nerve is irritated, it loses its elasticity and ability to lengthen the way it supposed to. It is important to improve the mobility of the nerve back to its normal length, like you would with an elbow that just had a cast removed from it. With improved mobility of the nerve it has the ability to heal and have less pain. Plantar Fascitis: Usually due to an over-stretched arch from a flat or high arch. Treatment by taping, manual therapy, orthotics, and use of night splints can provide relief. Long term prognosis is based not only treating the plantar fascitis itself, but also restoring proper mechanics of the entire leg. Nerve Pain: The tibial nerve, which is a branch of the sciatic nerve originating from the spine, can cause symptoms in the bottom of the foot. The key to treatment in nerve injuries is to determine why and where the nerve injury occurred and treat the nerve accordingly. Physical Therapists can use specific nerve mobilization techniques to improve nerve integrity – called neurodynamics. Myofascial Trigger Points: Muscle trigger points in the calf and foot muscles can cause referred pain to the foot. 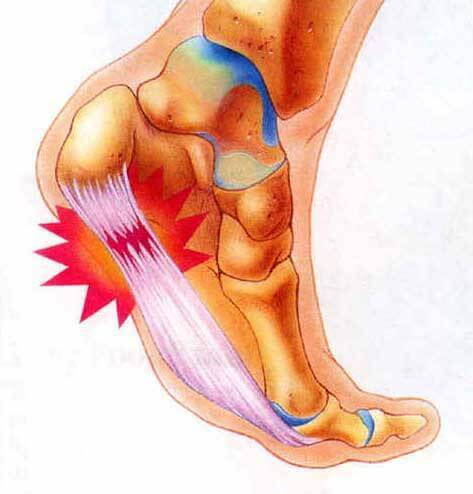 Soft tissue techniques and dry needling can be used to treat the trigger points referring and causing the ‘plantar fascitis’ like symptoms. It is common for joggers to have knee pain. It is usually due to a combination of improper strength and flexibility not only at the knee, but also the hip and foot. The hip is designed to absorb a majority of shock, as well as produce power through the gluteal muscles. The foot contacts the ground and provides proper ground reaction forces up the kinetic chain. If the hip or foot do not work correctly, the knee undergoes increased stress. Like a paper clip bending repetitively, injuries at the knee can then occur. In runners, pain can present itself in the front (i.e. patellar pain), outside (i.e. iliotibial band syndrome), or along the inside of knee (i.e. medial meniscus injury). It is important to address proper mechanics through the entire leg to allow a jogger to run efficiently without causing further injury. If running is causing more pain in the knee, it is recommended not to “run through the pain” but rather limit the running by staying short of pain before it gets worse. Take the time outside of running to address proper strength, flexibility and core stability to promote proper mechanics to jog at the distance and intensity you are striving for. Fitting of proper running shoes for your foot type should be considered as well as contacting a running coach to assess your stride and running mechanics.